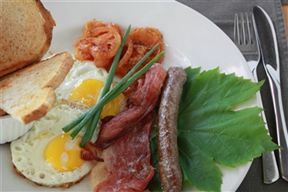 De Werf offers country-style cuisine in an elegant setting and serves breakfast, lunch and dinner at reasonable prices. The menu features organic ingredients,locally sourced meat and poultry and the freshest vegetables and herbs. An impressive range of wines and other beverages are also available. A laid-back atmosphere, good food and spectacular views are served a plenty. An unexpected oasis with friendly staff, good food and service! De Werf is 1.8km from the centre of Keimoes , the nearest airport 45.1km (Upington Airport).